The son of an MBTA bus driver from Jamaica Plain, Harvard sophomore Ted White helps lead the First Generation Student Union, pushing for a better understanding of challenges financially disadvantaged students face. WHEN ANA BARROS first stepped into Harvard Yard as a freshman, she felt so out of place she might as well have had the words “low income” written on her forehead. A girl from Newark doesn’t belong in a place like Harvard, she thought, as she marveled at how green the elms were, how quaint the cobblestone streets. Back home, where her family lives in a modest house bought from Habitat for Humanity, there wasn’t always money for groceries, and the world seemed gray, sirens blaring at all hours. Her parents, who immigrated to the New York area from Colombia before she was born, spoke Spanish at home. It was at school that Barros learned English. A petite 5-foot-2 with high cheekbones and a head of model-worthy hair, Barros found out in an e-mail that she’d been accepted to Harvard — a full scholarship would give her the means to attend. “I knew at that moment that I’d never suffer in the way that my parents did,” she says. For generations, attending an Ivy League college has been practically a birthright for children of the nation’s most elite families. But in 2004, in the hopes of diversifying its student body and giving low-income, high-achieving students a chance at an Ivy League education, Harvard announced a game-changing financial aid campaign: If a student could get in, the school would pick up the tab. (Princeton was the first Ivy to offer poor families the option, in 1998; Yale followed Harvard in 2005.) Families with incomes of less than $40,000 would no longer be expected to contribute to the cost of their student’s education. (In recent years, income eligibility has increased to $65,000, with significant grants awarded to families that make up to $150,000.) Having since been adopted, in one form or another, by all the Ivies, this “zero family contribution” approach opened the gilded doors of top colleges for many of the country’s most disadvantaged students. The number of students awarded a Pell Grant — financial aid of as much as $5,700 given to those with a family income of up to 250 percent of the poverty line, or about $60,000 for a family of four — is considered the best indicator of how many are low-income. At Harvard, where tuition, room, and board is estimated at $58,600, the Pell is a very small part of a student’s financial aid package. Last year, 19.3 percent of eligible Harvard students were awarded a Pell, an 80 percent increase since the admissions policy began 11 years ago. At Brown University, 15 percent of students get a Pell, and at Yale, 14 percent do. But receiving a full scholarship to an Ivy League school, while a transformative experience for the nation’s poorest students, is only the first hurdle. Once on campus, students report feelings of loneliness, alienation, and plummeting self-confidence. Having grant money for tuition and fees and holding down jobs, too, as virtually all of them do, doesn’t translate to having the pocket money to keep up with free-spending peers. And some disadvantaged students feel they don’t have a right to complain to peers or administrators about anything at all; they don’t want to be perceived as ungrateful. “IT’S TOTAL CULTURE SHOCK,” says Ted White, a Harvard sophomore. White grew up working class in Jamaica Plain and graduated as valedictorian (he was one of the only white kids in his senior class) from New Mission High School in Hyde Park; his father is an MBTA bus driver. From the start, the Harvard campus didn’t seem built for a kid from a background like his, he says. Classmates came in freshman year having started businesses or nonprofits (usually with their parents’ resources, he says) that could make even a top student wonder if he belonged. “The starting place for all of us isn’t really the same,” he says. White appreciates, for example, that Harvard gives low-income students free tickets to the freshman formal, but they have to pick up the tickets in a different line from everyone else. “It’s clear who is getting free/reduced tickets and who isn’t,” he says — a situation a Harvard spokesperson says the school is working to remedy. At times, White wondered if he’d made the right choice going to Harvard, even if he saw his matriculation, like many low-income students do, as his one shot at leaving his family’s financial struggles behind for good. Read: How did colleges become country clubs? Stephen Lassonde, dean of student life at Harvard College, says first-generation students have it particularly tough because they’re wrestling with their identities, like all students, while simultaneously trying to transcend their socioeconomic backgrounds. “As much as we do to try to make them feel included, there are multiple ways that their roommates and peers can put them on the outside without even intending to,” he says. 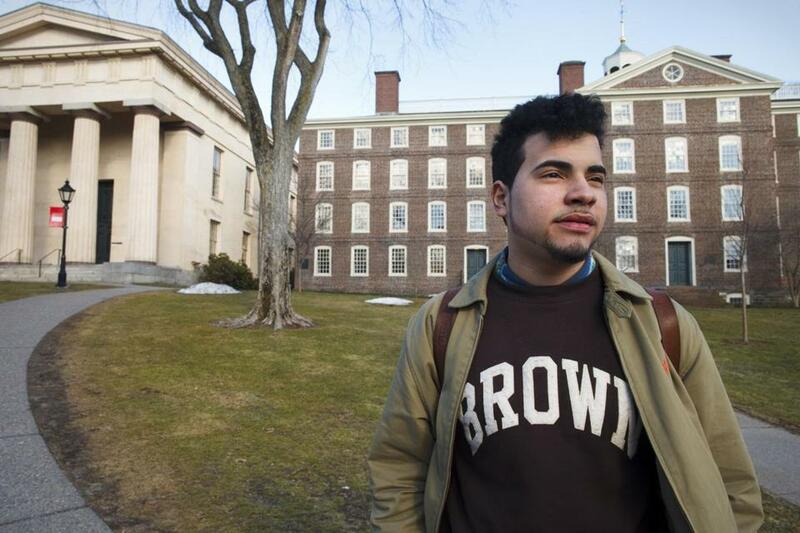 Freshman Alejandro Claudio navigates a different world at Brown. “If I fail, I’m going back to poverty, to working in a factory,” he says. All the groups are seeking greater visibility on campus: a more open dialogue about what it means to be a first-generation student at an Ivy League school, dedicated staff to serve as support, and a list of best practices so Ivies can use their abundant resources to ensure their most disadvantaged students are as equipped to succeed as other students. If the infrastructure at an Ivy League school assumes everyone comes from a certain socioeconomic background, as some first-generation students say, then change needs to come at an institutional level. Dining halls at some schools, for example, close for spring break, though some students can’t afford to leave campus. While tuition, room, and board may be covered. some universities tack on a “student fee” ranging from a few hundred to as much as a thousand dollars, an amount that can be devastating to those trying to figure out how to pay for books. Rakesh Khurana, dean of Harvard College, grew up in Queens as the son of a teacher in the Bronx. “We have to do a better job at making sure every student feels comfortable here,” says Khurana, who recently organized a task force to that end. In December, Harvard appointed two first-generation liaisons — one in the office of financial aid, the other in the office of career services — to help ease the transition for students. 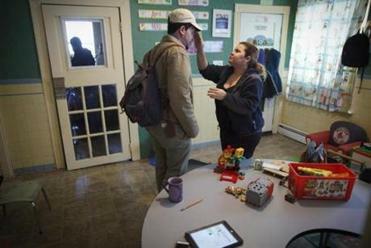 In January, Jason Munster, a first-generation low-income graduate student in environmental sciences and engineering from Maine, was named Harvard College’s first “first-generation tutor.” If you’re poor and struggling, Munster is the person you can go to for help. With an undergraduate degree from Harvard, Munster is also the campus liaison for the Harvard First Generation Alumni Network, founded around the same time as the First Generation Student Union. Claudio’s bright, windowed dorm room overlooks a grassy quad, and he can eat whenever he wants at the Ratty, the campus dining hall, because his meal plan is covered by his scholarship. During his first semester, friends looked at him like he had five heads when he said he’d never tasted falafel, kebabs, or curry. He had immigrated to the United States from the Dominican Republic when he was 8. “Growing up in a poor family, we ate the same thing every night: rice, beans, and chicken,” he says. 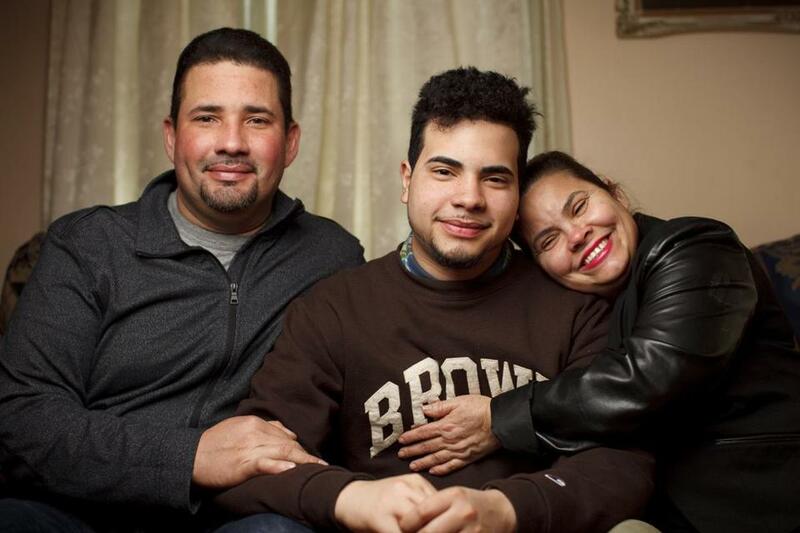 It was at Providence’s predominantly Latino Central High School that Claudio, who would go on to be class valedictorian, decided he didn’t want a job in the fish factories where many of his friends’ parents worked. He believed he might actually escape the West End when he met Dakotah Rice, his coach on the debate team and an undergrad low-income student at Brown. They’d get together at a Burger King across from Central to talk about Claudio’s future and his chances of going to Brown. “He understood my background, and we’d talk for hours about how I could get in. He was like, ‘If I can do it, you can too,’ ” says Claudio. Now that he’s on campus, Claudio sees just how big a social gap exists between him and other students. It was easy to mistake other African-American and Latino students as coming from a similar socioeconomic background — but after striking up a conversation, Claudio was shocked to learn many were as moneyed as his white peers. At the first ice cream social, one student mentioned his dad was a lawyer and his mom a doctor, then asked Claudio what his parents did. When he told them his dad was a welder, the conversation ended awkwardly. Later in the semester, Claudio confided in a well-off friend that his mom was asking him for money to help pay bills. “I’m sorry,” the friend said, which made Claudio feel worse. He’s since stopped sharing his background so openly. Anthony Jack, a resident tutor at Harvard alongside Jason Munster, is a PhD candidate in sociology studying low-income students at elite colleges. He says low-income students show up at his office every other week looking to vent about frustrations with campus life — or to ask a question they don’t know whom else to ask, like “How do I get a recommendation for a fellowship?” In his research, Jack looks at the experiences of both the “privileged poor,” low-income students who attend an elite, private high school before college, and the “doubly disadvantaged,” or students who aren’t familiar with the expectations and norms of elite colleges. His findings suggest that low-income students’ success on campus may be tied to the social and cultural capital they possess. For example, do they arrive with the same sense of entitlement as their more affluent peers, do they understand the importance of developing one-on-one relationships with professors to earn future recommendations? Brown is just a 15-minute ride from the apartment in Providence’s West End where Alejandro Claudio’s parents, Alejandro and Maribel Claudio, live. Jack says that the privileged poor adjust more easily to the campus culture than the doubly disadvantaged. The latter see professors as distant authority figures and feel guarded in approaching them, whereas the privileged poor, like upper-middle-class students, find it easier to cultivate the relationship. “You’re worth a professor’s time,” Jack will tell many of the students he mentors. Does this reluctance to ask for help ultimately impact graduation rates? Perhaps not as much at an Ivy League school as elsewhere. Nationally, the graduation rate for low-income, first-generation students in bachelor’s programs is about 11 percent, but that number increases dramatically at Ivy League schools, where most of the financial burden is lifted from students. According to data collected by I’m First, an online community for first-generation college students funded by the Bill and Melinda Gates Foundation, at Harvard and Yale, 98 percent of students from minority groups underrepresented in college will graduate with a four-year degree within six years; at Brown, it’s 91 percent. WHEN JUNIOR Julia Dixon steps inside the small cafeteria at Trumbull College at Yale, the short-order cook flipping hamburgers lights up: “Hi, Ms. Julia, what can I get for you today?” A man stacking crates of clean glasses says to the Southern-born Dixon: “Ms. Julia, it’s too cold for a Georgia peach today, isn’t it?” Wearing black-rimmed glasses and lipstick the color of Japanese eggplant, Dixon may be a long way from her childhood as the second oldest of 11 growing up on food stamps in rural Georgia. But she sees the dining room workers as family. In fact, when her parents rented a car and drove up to visit, they were nervous around Dixon’s friends — but they asked to meet the cafeteria workers. “Can you watch out for my baby girl?” her father asked the short-order cooks. That her parents reached out to dining hall staff on their one visit to campus, rather than a professor or faculty member, gets at the heart of the split identity Dixon has grappled with since her freshman year. She’s come to see herself as “Georgia Julia” and “Yale Julia,” and reconciling the two identities is complicated. Even her parents sense the change. On her second (and most recent) visit home in the three years she’s been at school, her father voiced concern at dinner one night that her education might cause her to drift away from them. “I don’t want you to be ashamed of us,” he said. At first, Dixon wouldn’t talk to her parents about what she was going through at school — a tough class she was taking, how much money she had in her bank account. She’s since realized that the only way to stay connected to them is to talk openly about her problems, even if most of what she’s experiencing is foreign to them. Along with working three jobs, she’s on the school’s ski team — her mom operated the chairlift at a resort near her hometown, and Dupler could ski for free. When she shared her background with some of her teammates, they were surprised. “I would have never have known you were low income,” one told her. Her best friend, who is from a wealthy suburb of New York City, helps her out when she needs it, though Dupler says she’s quick to repay her. Dupler thinks she’s been able to blend in more easily at Yale than some other low-income students because she’s white. “Typically, unless I disclose my background in some way, I’m assumed to be just like most of the other white students who grew up upper middle class in a perfect house in the suburbs,” she says. She likes seeing herself through other students’ eyes. Maybe it’s even convinced her that she can live a different kind of life. Still, graduation looms, and she worries about making it without the security of a Yale scholarship. “I feel like here I’m moving up the socioeconomic ladder. But when I graduate, will I slip back down?” As a result, she says, she’s become obsessed with her career. “My friends joke that my aspirations change weekly.” She’s currently set on getting a graduate degree in law and public policy and eventually a career in international relations. Brooke Lea Foster is a writer in New York. Send comments to magazine@globe.com. 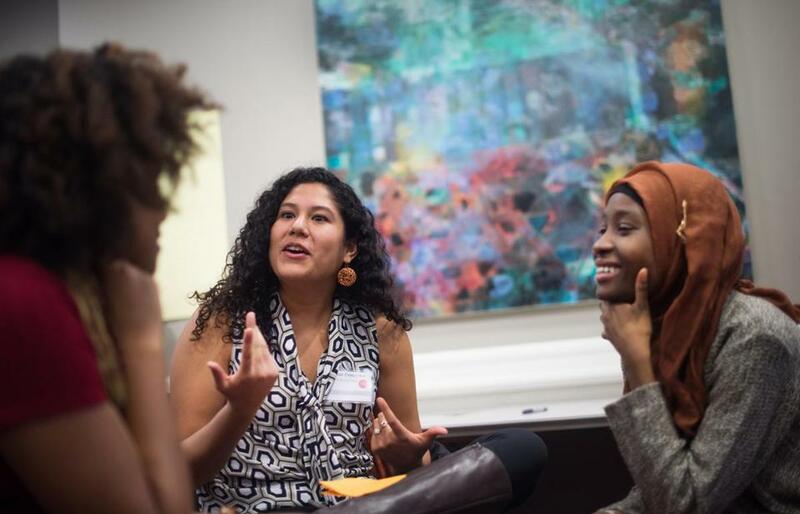 Esther Maddox from Princeton, Jasmine Fernandez from Harvard, and Kujegi Camara, also from Princeton, attended an open dialogue session at Brown’s 1vyG conference for first-generation students in February. A new group at Brown brings first-gens from many campuses together to agitate for change. Hailing from Brown and 15 other schools, some Ivies and some not, the students and more than 20 college administrators are here at the invitation of 1vyG, a first-generation student network launched last year at Brown. 1vyG’s founders, juniors Manuel Contreras, Jessica Brown, and Stanley Stewart, have been studying the obstacles that first-generation students like them face at Brown, and the three-day conference, believed to be the first of its kind, is a natural extension of that. Are students at other schools dealing with the same challenges, and how can they share information to help improve campus life for all? The weekend’s workshops are geared to fostering discussion between first-generation students and administrators and to boosting students’ coping skills on campus and beyond. Sessions include Navigating Class and Culture on Campus, Building a Career as a First-Gen, and Coaching College-Bound Students to Succeed. Contreras comes away from the event determined to repeat it. “At bare minimum, we’re going to be an annual rotating conference,” he says, with different schools playing host. Additional ambitions at Brown include setting up a textbook lending library and establishing a mentorship program to connect incoming students with current first-generation upperclassmen and alumni. • Eileen Rudden: Will education technology be the next growth sector? • How did colleges become country clubs?